Mirror neurons were first identified in the premotor cortex of monkeys in 1992, and since that time they have also been found in several other areas of the monkey brain, including the primary motor cortex, inferior parietal lobule, frontal cortex, and the area surrounding a sulcus called the intraparietal sulcus. There is very little conclusive evidence that mirror neurons exist in the human brain, although there is evidence from neuroimaging studies that indicates there are neurons in the human brain that display patterns of activity similar to the mirror neurons identified in the monkey brain. There is, however, one study to date that directly recorded the activity of purported mirror neurons in the brains of human patients who were being prepared for neurosurgery. Although this study could only explore certain areas of the brain (which didn't include the regions most frequently associated with mirror neurons in monkeys), investigators found neurons in the supplementary motor area and temporal lobe that displayed properties of mirror neurons. This, combined with the neuroimaging data mentioned above, suggests that mirror neurons likely exist in the human brain as well as the monkey brain. What are mirror neurons and what do they do? In 1992, a group of researchers at the University of Parma in Italy were recording the activity of individual neurons in the brain of a macaque monkey. They were observing neurons in the premotor cortex---specifically a region of the premotor cortex called area F5. Previous research had found neurons in this area to be active during goal-directed hand movements (e.g. grasping, holding, etc.). The investigators at the University of Parma were attempting to further understand this type of neural activation when they observed something surprising. They noticed that neurons in the F5 region of the monkey's brain were activated not only when the monkey moved its hands, but also when the monkey observed an experimenter using his or her hands (e.g. to pick up a food reward and place it in the testing area). Four years later, they named these neurons mirror neurons because they seemed to be active not only when monkeys performed a particular action, but also when they saw someone else perform a similar action. As mentioned above, since their initial discovery mirror neurons have been found in various other regions of the monkey brain (as well as in the brains of other species like songbirds), and there is evidence to suggest that mirror neurons exist in human brains. The discovery of mirror neurons has generated a type of excitement both in and outside of the scientific community that is not often seen in response to scientific findings. Some have interpreted the activity of mirror neurons as the basis for our ability to understand the actions of others---a deduction thought by some to be unjustified, and one that has led to other (perhaps even less justifiable) extrapolations. For example, some have claimed that mirror neurons provide the necessary neural machinery for empathy, complex social interactions, language---and even that they are responsible for the rapid cultural advancement of the human race that led to us becoming modern humans. Based on these proposed roles for mirror neurons, researchers began to speculate that impaired functioning of mirror neurons may be the basis for certain psychiatric disorders. For example, some have argued that dysfunctional mirror neurons underlie autism spectrum disorders (ASD). This hypothesis, sometimes called the "broken mirror hypothesis," suggests that individuals with ASD have abnormalities in mirror neuron networks that cause them to have an impaired ability to experience empathy, difficulty understanding the actions of others, and deficits in various aspects of social interaction ranging from eye contact to language. Indeed, in the few decades since their discovery, mirror neurons have been credited or blamed for a long list of things ranging from simple feats like helping us to enjoy watching sports to complex emotions like compassion to disorders like ASD and schizophrenia. The problem with these claims, however, is that they are mostly unsubstantiated. The first caveat to speculation about mirror neurons is that the vast majority of concrete evidence we have to support the existence of mirror neurons comes from studies in monkeys (concrete evidence in this case refers to evidence obtained from monitoring the activity of individual neurons---something that is difficult to do in humans except in rare circumstances like the example cited above where mirror neurons were explored in patients preparing for neurosurgery). Therefore, at this point we cannot with confidence attribute behaviors to mirror neurons unless we have been able to record mirror neuron activity while monkeys have exhibited such behaviors. Thus, we do not yet have the evidence to consider complex human emotions and behaviors (which can only be roughly approximated in studies of non-human primates) as attributable to mirror neurons. Similarly, the evidence to point to dysfunctional mirror neurons as the main causal factor in human psychiatric disorders is lacking. Let's take the hypothesis that dysfunctional mirror neurons contribute to ASD as an example. This hypothesis was initially supported by two highly-cited studies from the early 2000s. One was a neuroimaging study that found reduced activity in autistic patients in a part of the brain thought to be heavily populated with mirror neurons. The other used electroencephalography to measure electrical activity believed to be indicative of mirror neurons; again, individuals with ASD appeared to display abnormalities in this activity. Each of these studies, however, failed to replicate multiple times. Additionally, critics of the "broken mirror hypothesis" have been quick to point out that there is not good evidence that individuals with ASD even have deficits in understanding the intentions of others. Thus, the "broken mirror hypothesis" has been found to be wanting, and other hypotheses that attribute psychiatric abnormalities to mirror neurons are similarly in need of more support to make them tenable. Even when it comes to just the basics of mirror neuron function, we are still searching for answers. For example, some researchers argue that the evidence that mirror neurons are involved with something as abstract as understanding actions is inadequate. According to this perspective, even if mirror neurons may be involved with functions like recognizing basic movements, selecting movements to make, etc., the evidence isn't conclusive to suggest mirror neurons are involved with a type of higher-level cognition like understanding the behavior of others. This is a critically important point as the idea that mirror neurons help us to understand others' actions is essential to the interpretation of mirror neurons as being involved in behaviors like empathy and social interaction---and indeed is the basis for much of the enthusiasm about mirror neurons in general. Thus, while mirror neurons have been lauded for their ability to explain a variety of uniquely-human behaviors and accomplishments, it seems that we may have jumped the gun a bit on our interpretation of the activity of these cells. Much more research still needs to be done before we can say with confidence what mirror neuron activation really means in terms of behavior---and indeed before we can be sure that mirror neurons are as prevalent in the human brain as they are in the monkey brain. As with all scientific discoveries, it is best to be conservative in our interpretations until they are the only logical ones to make based on the data. Hickok G. Eight problems for the mirror neuron theory of action understanding in monkeys and humans. J Cogn Neurosci. 2009 Jul;21(7):1229-43. doi: 10.1162/jocn.2009.21189. Kilner JM, Lemon RN. What we know currently about mirror neurons. Curr Biol. 2013 Dec 2;23(23):R1057-62. doi: 10.1016/j.cub.2013.10.051. In this video, I describe the mechanisms underlying neurotransmitter release. I discuss how calcium influx is thought to play a role in mobilizing and preparing synaptic vesicles for neurotransmitter release, and I cover the hypothesized mechanism by which vesicles fuse with the cell membrane of the neuron to empty their contents into the synaptic cleft. By the start of the 18th century, brain scientists were beginning to develop a better understanding of the complex anatomy of the nervous system. The physiology of the brain, however---or the way in which the brain functions---was still an area dominated by speculation and lacking in experimental evidence. One extremely important but unanswered question at the time involved the physiology of the nerves. Scientists in the beginning of the 18th century still relied on observations made by the ancient Greeks when attempting to explain nerve function, but those insights did not seem to be matching up with recent laboratory discoveries. The dominant hypothesis regarding nerve function at the beginning of the 1700s centered around the ambiguous concept of animal spirits. The notion of animal spirits is thought to have originated with the ancient Greeks, and was advocated by Galen---whose influence may have helped the doctrine remain dominant for over 1500 years. The animal spirits hypothesis suggested that the hollow nerves of the body were filled with spirits---invisible, intangible substances that acted in a mysterious manner to cause movement or allow sensation to occur. According to Galen's view, a form of spirits called natural spirits were produced in the liver after the consumption of food. Natural spirits then were sent to the heart, where they were converted to vital spirits. Vital spirits were carried in the carotid arteries to the brain to either the ventricles or to a complex of arteries at the base of the brain that Galen called the rete mirabile, or "wonderful net." In one of these locations, the vital spirits were converted to animal spirits---the highest form of spirits. The animal spirits were then stored in the ventricles until they were needed. Although the animal spirits hypothesis was still the prevailing hypothesis at the start of the 18th century, investigators were not having success in experimentally verifying the existence of the spirits. This led to the exploration of other hypotheses, like Thomas Willis' idea that the nerves carried fluid that dripped onto muscles to stimulate them. These new hypotheses, however, also did not seem to stand up to experimental scrutiny. But this changed early in the 18th century when some scientists began to suggest that electricity was the enigmatic substance that filled the nerves. At the time, appreciation for the wonders of electricity was rapidly growing. The first devices that could produce and store electricity, known respectively as friction machines and Leyden jars, appeared in the first half of the 18th century. These contraptions could be used to create dazzling displays, and became a popular novelty at social engagements. It was also soon recognized, however, that electricity had some potential medical applications. It seemed to be particularly effective at stimulating the muscles of paralyzed limbs to contract. This led some to hypothesize that electricity was the substance that flowed through the nerves. This hypothesis was bolstered when it was verified that the shocks produced by electric fish (e.g. the electric ray) were caused by actual electricity, as it proved that electricity could exist within the confines of an animal's nervous system. It was at this time, when excitement about electricity as a mechanistic component of the nervous system was beginning to grow, that Luigi Galvani would make his seminal contributions to the field. Galvani was a doctor and professor of anatomy at the University of Bologna in Italy. In the 1770s, he began to explore electricity and its association with the nerves, conducting his experiments in his own home and mostly with frogs as the subjects. 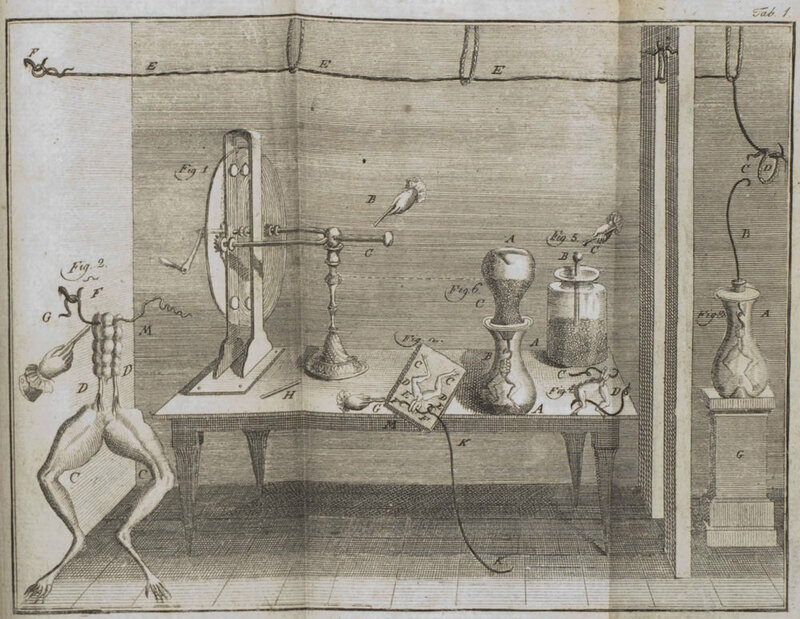 An illustration from Galvani's 1791 publication that shows some of the devices (along with frog preparations) used in his experiments. In 1791, after 10 years of research into the subject, Galvani published the work that would make him famous, his Commentary on the Effects of Electricity on Muscular Motion. In the treatise, Galvani described a series of experiments that made a strong case for the natural involvement of electricity in the nervous system. First, Galvani discussed an observation that occurred serendipitously. He had placed a dissected frog on a table next to an electrical machine, and when one of his assistants touched the frog's nerves with a metal scalpel at the same time as the electrical machine emitted a spark, the frog's leg muscle contracted, causing a convulsive movement of the limb. Galvani further explored the ability of electricity to cause muscle contractions. He found that when a wire was stretched from the electrical machine to the frog's leg, a convulsion was also elicited. He extended the finding to mammals, observing that similar types of contractions could be generated in chickens and sheep. Galvani then began to investigate the effects of natural sources of electricity, showing that lightning (as conducted by a lightning rod and down a wire) was also capable of producing muscle contractions when it was given a path to a frog's limbs. These experiments were all interesting, but they were not groundbreaking on their own. Other investigators had observed the ability of electricity to elicit muscle movement. But the next experiments Galvani conducted, and the resultant deductions he made, are what really caused his research to stand apart from the rest. As a way to attach conductors or hang the frogs outside his home for experiments with lightning, Galvani had fastened brass hooks to the frogs' spinal cords. He was inside with a frog that had a brass hook attached to it when he pressed the frog, along with the hook, up against a metal plate. To Galvani's surprise, the frog exhibited the same type of convulsive movements the application of electricity had caused. This suggested the movements were not dependent on some external source of electricity, and led Galvani to make the deduction that "the electricity was inherent in the animal itself." Galvani went on to hypothesize that this "animal electricity" was produced by the brain and distributed by the nerves to the muscles (the brain as the "source" of electricity would not stand up to scrutiny once researchers began to better understand the electrical properties of neurons). He also postulated that the nerves must be covered with a fatty insulatory material---a hypothesis that preceded the discovery of that insulatory material (i.e. myelin) by over 60 years. Galvani's findings and deductions were very influential. Other hypotheses about nerve function, like the animal spirits doctrine, began to fall out of favor. Although many questions about the electrical properties of the nervous system remained, at least now investigators had a mechanism for nerve function that could be observed and measured (unlike the elusive animal spirits). Galvani's discoveries would form the foundation of the modern study of nerve function. Galvani was not able to fully appreciate the significance of his observations or the popularity they engendered. His wife died in the same year he published his findings (1791). He was devastated and never seemed to be the same emotionally. He spent the next seven years defending his conclusions from critics, especially the well-known well-known Alessandro Volta, who incessantly attacked Galvani's work as insufficient to support the deductions he made. Galvani died in 1798, uncertain of how important his discoveries would become and unaware that they would be an essential piece in the foundation modern neuroscience has been built upon. Galvani L. Commentary of the effects of electricity on muscular motion. Foley MG, translator. Norwalk, CT: Burndy Library; 1953.